When you add a modern page to a site, you add and customize web parts, which are the building blocks of your page. Have a book you want to recommend or promote on your page? You can easily share a preview of a Kindle book using the Kindle instant preview web part. To use this web part, you'll need to get the embed code of the book you want to preview. To learn how to do that, see the Kindle instant preview site. 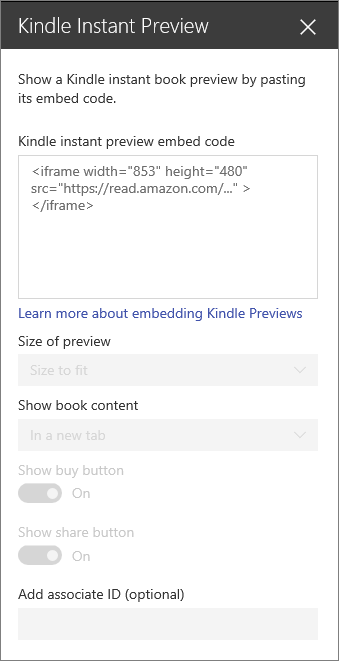 Hover your mouse above or below an existing web part or under the title region, click , and then select the Kindle instant preview web part. In the toolbox on the right, enter the embed code. You can find the embed code by following the instructions on the Kindle instant preview site. Associate ID (optional) - add this if you are part of the Amazon Associates program.